Located less than an hour's drive from Canada's biggest city, Toronto (and only two hours away from the Niagara Falls / US border), is the city of Guelph considered one of Canada's top ten places to live. And speaking of quality…the city's star institution of higher education, the University of Guelph, is regarded as one of the country's top comprehensive universities making it a perfect choice for the 700+ international students who choose it each year. Particularly strong in the science departments, Guelph has a number of favourite programs when it comes to attracting Bangladeshi students, including those in the areas of biological science, food & agricultural sciences, engineering, and business. And for anyone interested in pursuing a career in health care, the school's nursing and health sciences programs are highly regarded and a great choice for those hoping to find work in Canada post-graduation, as the country's demand for professionals in this field is growing each year. For those students interested in combining their Canadian university experiences with more varied international experiences, Guelph is a strong supporter of study abroad offering more than 50 different student exchange and/or semester abroad options in 30 countries around the globe. For international students feeling torn about where they want to study, it no longer needs to be an “either / or” decision! Guelph students can choose to spend semesters abroad, exploring and studying at other partner institutions in the UK, US, and other exciting destinations worldwide. 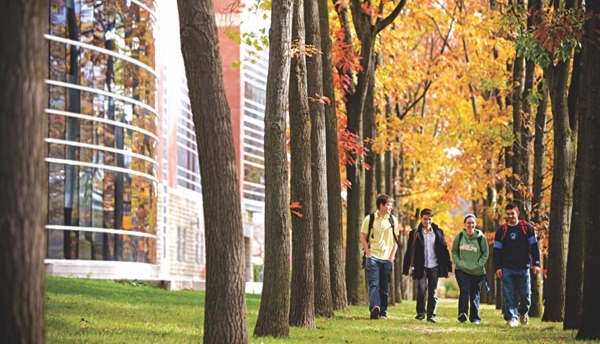 Another major draw for the University of Guelph is the quality of student life found on campus. Particularly with the list of student clubs numbering well over a hundred, there's always a lot going on! Or, for students preferring less 'organized' activities, state-of-the-art exercise facilities (including two swimming pools, two ice rinks, six squash courts, climbing wall, and fully staffed fitness centres) are available throughout the year, as are two campus art galleries. PARTICIPATING UNIVERSITIES: Victoria, Winnipeg, Algoma, Guelph, Windsor & SMU. *** BY INVITATION ONLY. Contact us today to attend! If you or someone you know is interested in learning more about attending the University of Guelph or another Canadian institution be sure to visit www.canada123.org. Students and families can also visit the Canadian University Application Centre (or 'CUAC') office located on Gulshan Road. On Friday, October 28th, Guelph will attend along with other Canadian university representatives, a special Canadian University Education Fair, at The Westin Dhaka. Guelph will have its international admissions coordinator in Dhaka, ready to answer all your questions with typical Canadian helpfulness. This event, however, is by INVITATION ONLY. For those interested, please email Dhaka@canada123.org , or phone at 02.8826445. Although Rafael Diganta was initially attracted to the University of Guelph after he found out it was placed among the top comprehensive universities in Canada, it wasn't until he learned more about the university's location that he finally decided it was definitely the place for him. Considered one of Canada's most 'livable' cities, it is no wonder that the city of Guelph caught the international student's eye as an ideal place to study. And, according to Rafael, his own experiences living in Guelph have more than lived up to the city's shining reputation. But besides studying which he takes very seriously Rafael has also gotten involved in some extra-curricular activities, even taking on a leadership role as Vice President of Communications for the Biochemistry Student Association. As such, he was responsible for facilitating communication between the new biochemistry major students and the department's faculty members. Overall, Rafael says that the best things about the University of Guelph (in his opinion), can be summed up as follows: “Friends, the people of Guelph, residence life, and the U of G campus itself especially the arboretum.” All of which have combined, he says, to make for one unforgettable Canadian university experience.